The latest version of Acrobat Reader DC (15.023.20053) has been released to fix various security holes that allow malware to enter and control your system. 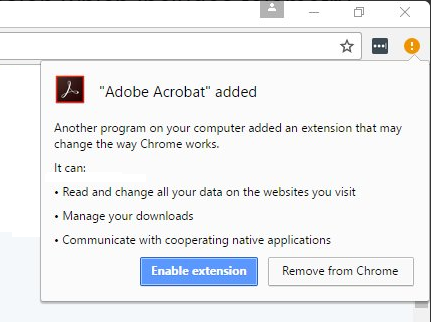 This update also silently installs the Acrobat Reader DC extension into your Chrome browser (Windows Only). The extension is installed automatically without any input from the user and also has anonymous usage data collection turned on by default. If you’re curious about what data will be collected, you can read the Adobe Product Improvement Program. The good news is that Chrome has safe guards in place to prevent applications from silently installing extensions. When you next launch Chrome it will show a notification informing you that an extension was installed. If you want to remove the extension all you need to do is select the “Remove from Chrome” option. Next to the Adobe Acrobat extension, click the trash can icon, then Remove. There are plenty of alternative PDF plugins available for Chrome. Just search the Chrome Web Store for a PDF viewer that will fit your needs. If you’re just wanting to “Save as PDF” you don’t need an extension as Windows now comes with the ability to save or print web pages as PDF (just go to Print, then Save as PDF). If you need a more advanced PDF editor to create, modify, & edit PDFs, try using PDF Studio instead. PDF Studio™ is an all-in-one, easy to use PDF editor that provides all PDF features needed at a fraction of the cost of Adobe® Acrobat® and other PDF editors while maintaining full compatibility with the PDF Standard. See our comparison grid which compares the main features available in Adobe Acrobat to PDF Studio.